Is it possible to heal by thought alone—without drugs or surgery? The truth is that it happens more often than you might expect. In You Are the Placebo, Dr. Joe Dispenza shares numerous documented cases of those who reversed cancer, heart disease, depression, crippling arthritis, and even the tremors of Parkinson’s disease by believing in a placebo. Similarly, Dr. Joe tells of how others have gotten sick and even died the victims of a hex or voodoo curse—or after being misdiagnosed with a fatal illness. Belief can be so strong that pharmaceutical companies use double- and triple-blind randomized studies to try to exclude the power of the mind over the body when evaluating new drugs. 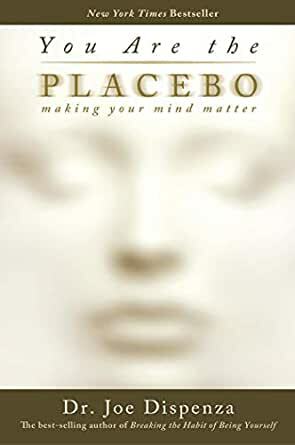 Dr. Joe does more than simply explore the history and the physiology of the placebo effect. He asks the question: "Is it possible to teach the principles of the placebo, and without relying on any external substance, produce the same internal changes in a person’s health and ultimately in his or her life?" Then he shares scientific evidence (including color brain scans) of amazing healings from his workshops, in which participants learn his model of personal transformation, based on practical applications of the so-called placebo effect. The book ends with a "how-to" meditation for changing beliefs and perceptions that hold us back—the first step in healing. I must admit I thought this book was going to be another rehash of similar works but I was pleasantly surprised. I have taught neuro-linguistic programming, hypnosis and time-line therapy to the master practitioner level and so much of Joe's book was not new to me. I also run a company creating health plans from genetic tests and so I am very aware of the advances in epigenetic understanding and how this relates to our health choices. I met Joe at the Mind Heart Connect conference on the Gold Coast and was impressed with his talk, which led me to buy the book. Joe has taken aspects of many fields including; neurology; biology; epigenetics; physics; quantum physics; meditation and pieced them together using evidence, some anecdotal but in most cases backed up with hard science, to create a complete hypothesis for health and wellness. He then goes on to take this hypothesis to the masses in the form of workshops and many of the participants experience incredible healings from all manner of disorders, including the incurable ones. I like the way Joe's mind works, because as if that were not enough, he then investigates further by bringing in doctors and neuro-scientists to study the brain waves and heart coherence of participants at his workshops and makes some startling discoveries. A great read. I have recommended it to a number of friends already. Very very interesting reading. Really made me think about so many things in many different ways. I've adopted one of his meditations and I can honestly tell you that it's a game changer. You have no idea just how powerful humans are until you read about the research and the people who have taken control of their reality. Dispenza is onto something BIG and I can only recommend you read the book yourself and learn about the real mind in action. If you read Seth, this will be even more relevant because Dispenza really gets it! I'm glad I got it now in library at home ! The ideas presented in this book are a reminder that we can harness a greater responsibility for the health outcomes of our lives. Placebo suggests that it is the thoughts and beliefs which drive our decision making that characterize outcomes of our health status. Dr Dispenza encourages readers to acknowledge stressors and negative expectations and reroute them, creating new neural pathways so to allow for the release of the endless supply of beneficial chemicals we produce to maintain optimum health. The book is well structured and carries intelligent arguments. 5.0 out of 5 starsThoroughly credible and inspiring. This book explains the science behind the placebo effect, documents its awesome power and why it seems to work for some but not others. Best of all it gives instructions to enable anyone to harness it to change their health and their life. I am half way through the book and I am loving every word. I always deep inside of me knew that people can change themselves and their life.And Dr Joe Dispenza explained it so well by using research data and also using language that anyone can understand. Thank you Dr Joe Dispenza for writing this book. This is the best and most spiritually connected book I have ever read. Given the choice this book is the one book I would I keep and refer to forever! How intersting! This is so informative with lots of data to back it up as well. I am going to try some of the things mentioned. Got me really thinking about how we accept things that are told to us and then our body follows that thought process. WOW!